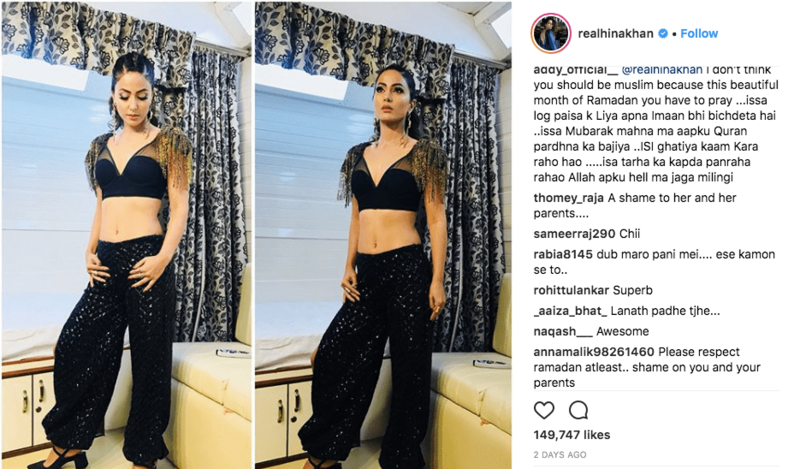 Reality show and daily soap actor Hina Khan was asked to ‘dress appropriately’ during Ramzan by radicals on her social media account. The actor had posted pictures where radical Islamists had told her she will go to hell for ‘dressing inappropriately’. Radicals moral policing Hina Khan, saying she will go to hell. They even tried to shame her for posting ‘such pictures’ during Ramzan. This is not the first time fundamentalists have attacked celebrities. A popular Bengali actress Nusrat Jahan was earlier insulted on Facebook for celebrating Durga Puja as it was ‘inappropriate’. Cricketer Mohammad Kaif was trolled by Muslim fundamentalists for celebrating Christmas with family. He was also attacked for doing Surya Namaskar. Cricketer Irfan Pathan, too, was told by fundamentalists that Raksha Bandhan is ‘against Islam’. Mohammed Shami too has had his share of such incidents. In July last year he was trolled for celebrating the birthday of his daughter. They were offended especially by ‘the way Shami celebrated’ the birthday. He also in the past had to deal with angry comments for the photo of his wife in a gown. Also it isn’t just Indian cricketers who have been plagued by such incidents. Even English cricketer Moeen Ali was trolled on Twitter for drawing a picture because he was going against the traditions of Islam.